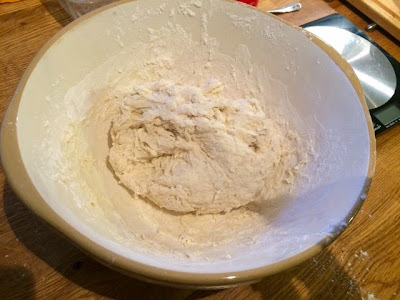 Making bread is one of those things in cooking that a lot of people avoid with the excuse of ‘It’s too complicated’ or ‘It takes too long’ or ‘It’s not worth the effort when I can buy it in the supermarket’. Let me tell, you it is WELL with the effort and with this recipe not at all difficult or time consuming either. I feel pretty similarly about making bread as I do making pasta. Even though it’s something you can easily buy, there’s just something so incredibly satisfying about making your own. Of all the weird and wonderful, exciting, exotic and interesting things you can cook up in the kitchen nothing will give you more of a sense of achievement than baking your own bread. 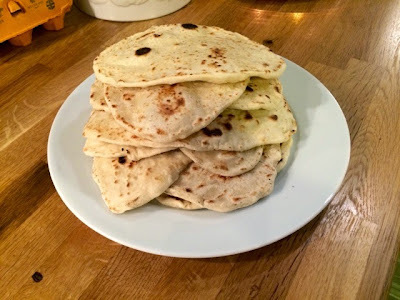 These flatbreads (recipe courtesy of my friend Ali) are a really good place to start as they’re pretty quick and easy and very difficult to go wrong with. 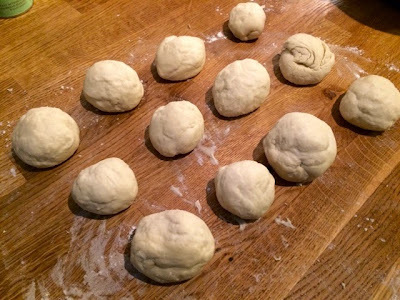 Once you get used to dough and how the bread making process works you can take these skills to any bread recipe and really get experimental. I’ve not done too many bread recipes on the blog yet but I’m planning on bringing you some more soon. 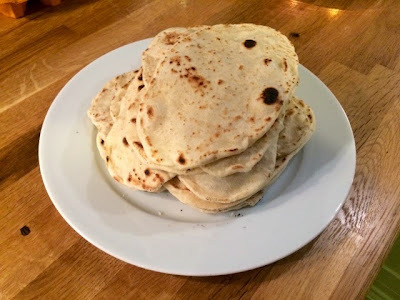 In the meantime if you fancy giving some other types of bread a go I have a great recipe for a Basic White Loaf and another for scrumptious Garlic Bread Rolls. 1. In a bowl add the flour, yeast and salt. Make a well in the middle in which to pour the water. 2. 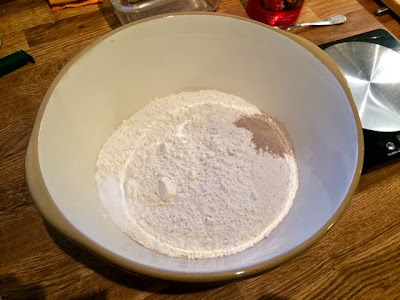 Add the water and using your hands (or a dough scraper if you have one) to mix the flour and water together into a dough. 3. 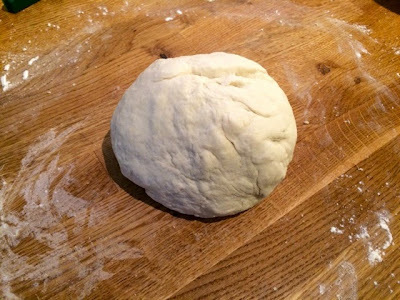 When all of the ingredients have come to together tip your ball of dough out onto a well floured surface an knead thoroughly for about 10-15 minutes. Leave to rest for another 10 minutes. 4. Split into smaller evenly sized golf ball sized balls. This amount of dough should make bout 12. 5. 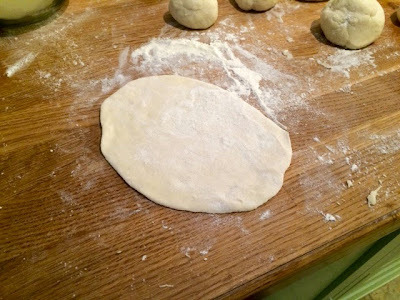 Roll each ball out into a flat round shape to form your flatbread. Brush the top lightly with a small amount of oil. 6. 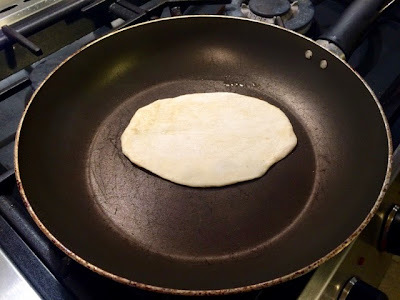 Place oil side down in a hot dry pan. Lightly brush the other side and cook for 1-2 minutes until golden underneath before flipping over to cook the other side. 7. 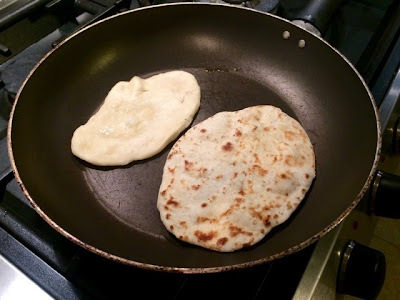 Do one at a time, or two if you have room in the pan and when each one is cooked set aside ready to serve. 8. 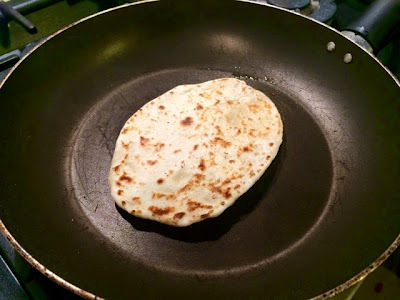 Serve your flatbreads warm with a selection of dips or with a curry instead of rice.